Knight F10A Grade 2 Single Reed Rolling Shutter Door Alarm Contact 18"
The F10A Heavy Duty Rolling Shutter / Garage Door Contact with 18 of Armoured Sleeving from Knight Fire & Security is a potted single reed contact alarm ideal for placement in rolling shutter doors in moderate-risk domestic or commercial areas. 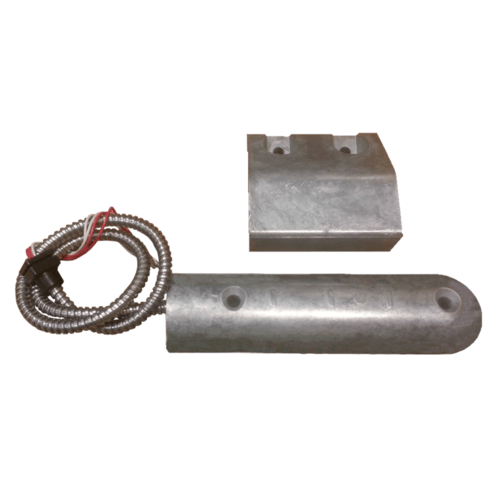 When wired to an alarm system, these contacts will trigger the sounder if the gap opening exceeds 50mm, and as the contact creates a circuit to your security system, wire tampering or a forced break of the circuit elsewhere will also sound the alarm. What is meant by the tearm Grade 2? Grade 2 refers to the grade of intruder alarm system you have on the premises, especially if you are depending on the alarm system for insurance cover in your home or business. A Grade 2 Alarm basically means Low to Medium Risk, Intruders are expected to have a little more knowledge of the alarm system and use a general range of tools and some specialist equipment. This contact features a durable weatherproof metal body for commercial uses, and 18 of armoured sleeving to pretect the conecting cable to your system.